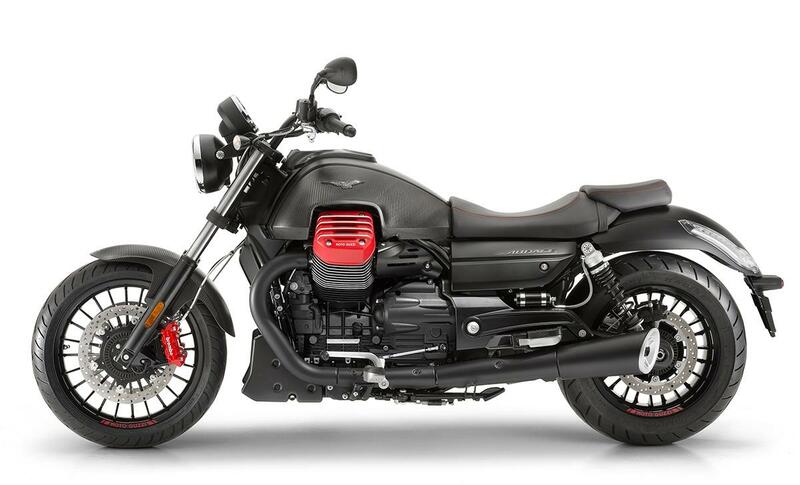 Joining the standard Moto Guzzi Audace for 2017 will be the new Audace Carbon which, as the name suggests, features carbon bodywork as well as improved ergonomics. The Audace Carbon doesn't feature entirely carbon bodywork though, just the front mudguard and tank. The remainder of the bodywork stays matte black, with no chrome plating anywhere on the bike and the cylinder head covers painted matte red. Miguel Galluzzi, the designer in charge of the PADC (Piaggio Group Advanced Design Center) in Pasadena California, introduces the new Audace: “Moto Guzzi's desire to grow is perfectly summed up in the strong and uncompromising character of the new Audace. I believe that this bike, today, speaks louder than any words about the more modern soul and future of the brand from Mandello. A secondary air sytem has been developed for the 90º V-twin to make it Euro4 compliant and torque has been increased to 89ftlbs at 3000rpm. The Audace Carbon comes with three riding modes - Veloce, Turismo and Pioggia (rain). The Moto Guzzi Multimedia Platform (MG-MP), which connects to a smartphone and consequently the internet, is avilable as an option with the Audace Carbon. With MG-MP you can view upto five parameters at a time, including speed, revs, instant power, instant torque, instant and average fuel consumption, average speed and battery voltage, longitudinal acceleration and extended trip computer. MG-MP will also direct you to the nearest petrol station when low on fuel and store data from your rides.